How much should school teachers earn considering the fact that most get several weeks off from work for summer vacation? Recent protests and labor unrest from five states suggest that many educators believe they should be earning a lot more, sometimes as much as 20% more. So where can teachers earn the highest incomes today? The Bureau Labor Statistics tracks overall employment and average wage numbers for a variety of professions across all 50 states. We collected figures for teachers at all three levels (elementary, middle and high school) to create three color-coded heat maps of earnings. 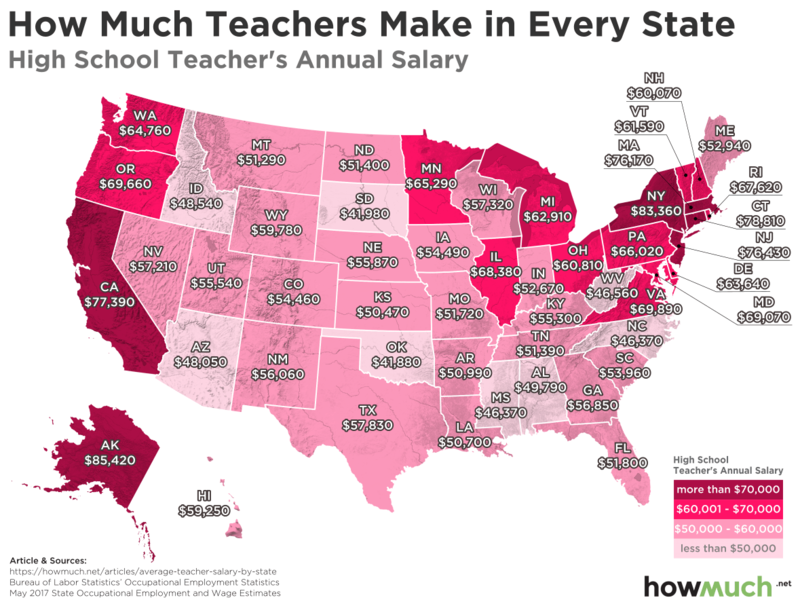 This provides us with three snapshots of teacher compensation in the U.S.
We also calculated the average between elementary, middle and high school teachers to create a top-ten list of states where teachers earn the most. Our maps illustrate how there are enormous differences in earning potential for teachers across the country. The coasts offer the highest salaries, led by liberal states like New York and California, where teachers can make tens of thousands of dollars more than the national average wage of about $49k. There are also a couple of states in the Upper Midwest where teachers can make between $60-70,000, including Illinois, Minnesota and Michigan. The combination of above-average incomes with great benefits like a pension make these places ideal for teachers. But our map also reveals places where teachers make relatively little, even less than the national average. Take a look at the South and rural Western states like Oklahoma, South Dakota and Mississippi. The juxtaposition between low-wage states like Arizona (average: $45,313) and California (average: $76,513) is especially dramatic. Of course, one explanation for the difference has to do with the cost of living. Phoenix just isn’t anywhere near as expensive as San Francisco. The most interesting trend in our maps has to do with different wages for different levels of education. 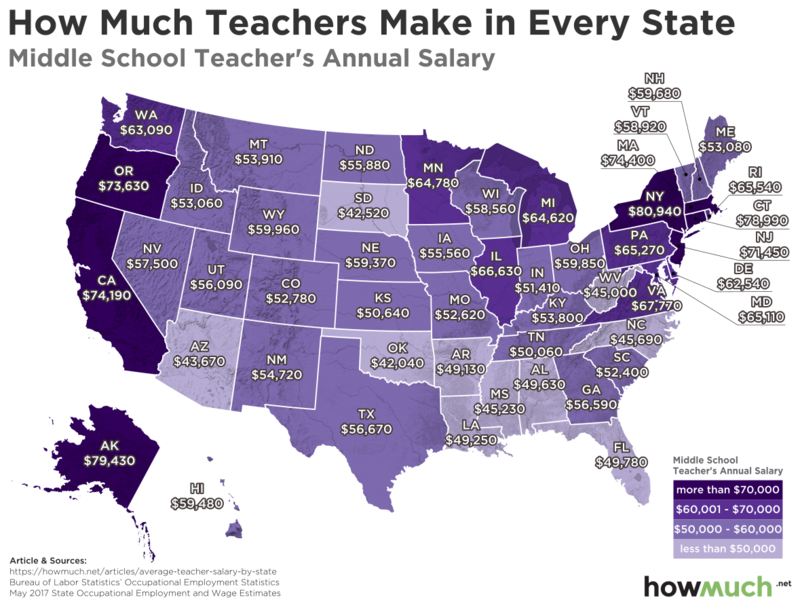 The biggest outlier is Alaska where a high school teacher makes on average $8,390 more than an elementary school teacher. Compare that to Idaho, where middle school teachers make $4,520 more than their colleagues in high school. Likewise, in Oregon, moving from elementary to middle school results in average pay increase of $7,990. Teacher licensing requirements are defined at the state level, which could partly explain these differences in compensation. Still, making $8,000 more each year is a powerful incentive to just teach at a different grade level. Our maps indicate that some educators clearly make a lot more than others, depending both on where they live and which grade they teach. Those differences may or may not justify the teacher strikes and walkouts happening around the country, but it does highlight the different values some states place on education.